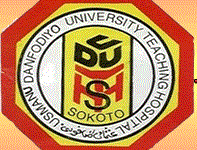 Usman Danfodiyo University Teaching Hospital, UDUTH School of Health Information Management, SHIM National Diploma, ND and Higher National Diploma, HND Admission Screening Date, Time and Venue for 2018/2019 Academic Session. Invited candidates are requested to come along with their writing materials and also advised to be orderly during the exercise. Management hereby stress that, the screening test is exclusively for the shortlisted candidates only. People other than those shortlisted and invited are advised to keep away as security personnel will be strategically mounted to ensure hitch free exercise.